After our overnight stay in Charleston with Tory & Clay, our next destination was Savannah! I have never been to Savannah, so I was super excited to see the southern charm that Forsyth Park had to offer. We had a late lunch at Huey’s on the river (thanks for the recommendation from a Costola Bride, Lauren! ), had the BEST bloody mary of my ENTIRE life, then walked around Historic Savannah where we met up with Lizzie and Drew. Turns our, Lizzie is from good ol’ Southern Maryland! She went to high school with Candace and ended up moving back south to her roots where she was born. I can TOTALLY see the pull! The south is just so.. charming. Everyone is kind (including the 20 people who allowed Candace and I to overly-love on their dogs in the park). 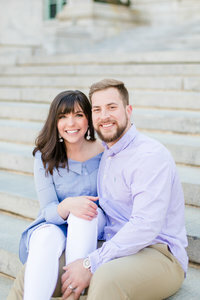 Lizzie and Drew just celebrated their eleven month anniversary of dating, so what perfect time to celebrate with a portrait session in the park! I fell in love with these two right away – their love each other is infectious! Here are my personal favorites from the afternoon. To view more destination sessions, browse the links below! A Cedar Lakes Woods and Garden Proposal!